If you have styled your form with Styles & Layouts for Gravity Forms plugin then you can easily save and export the design to another form or website. In this article, I will show you how to use Custom themes addon for creating, saving, exporting and importing themes. Export design to forms on another site. Let’s consider that you created the perfect design for one of your forms using ‘Styles & Layouts’ plugin. You liked it so much that you wanted to have the same design for all the forms on the site. So, how can you do that? Here is the step by Step tutorial for Saving Gravity Form Themes. 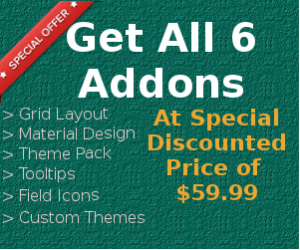 Install and activate ‘Custom Themes’ addon. Now open ‘customizer’ and then go to ‘Styles & Layouts for GF’ section. Here select the form whose design you want to save as a theme. If you haven’t designed the form yet then here are the instructions to do that. 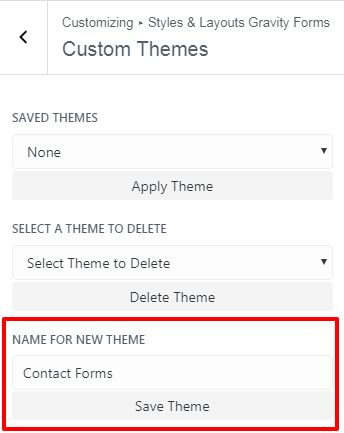 Now go to ‘Custom Themes’ setting and give a name to your theme under ‘Name for Current Style’ setting and then click on ‘Save Theme’ button. You have to follow the same steps ( customizer -> form select -> Styles & Layouts for GF -> Custom themes). 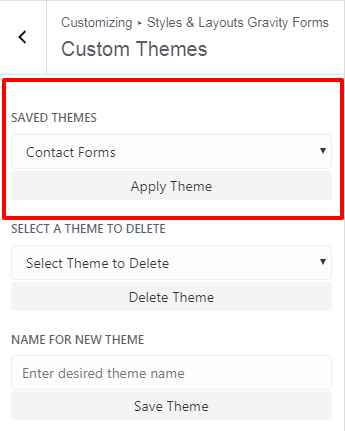 When you are in the Custom themes section then select your theme from ‘Saved Themes’ setting and then click on the ‘Apply Theme’ button to apply it. How Apply Saved Theme on a Form of Another Site. To do this we will be exporting the design as a .json file and then importing it on the other site. This may sound a little complex but it is a simple process. You need to have ‘Styles & Layouts’ as well as ‘Custom Themes’ activated on both sites for this to work. From WordPress dashboard go to Styles & Layouts for GF -> Import/Export section. Now select the form from which you want to export the theme design. Now click on ‘Export Form Styles’ button and then it will download a .json file. Login into the website where you want to import this theme design. Then navigate to Styles & Layouts for GF -> Import/Export section. Now click on ‘Choose File’ button under ‘Import Form Styles’ section and then select the .json file you downloaded in one of the previous steps. Select the form on which you want to implement the imported styles and then click on the ‘Import Form Styles’ button. Now your form will get the design you imported. Import and Export your styles. If you need any help or assistance with designing Gravity forms or need some custom functionality built for your WordPress website then feel free to contact us.